There is quite a way to go and many excellent choices already, but there is a new front-runner for best play of 2018 in Chicago. 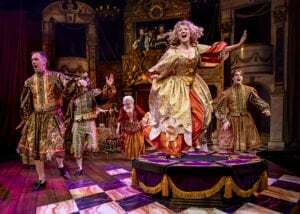 Chicago Shakespeare Theatre’s Nell Gwynn is thoroughly entertaining, exquisitely costumed, winningly directed and brilliantly performed. It is laugh out loud funny from the first moments and poignant when it needs to be. Further, the Olivier Award-winning play by Jessica Swale has the kind of life and joie de vivre that makes you want to go back to see it again and again. If I had five stars to give, I’d do it, and I’m tempted to do it anyway. Swale’s play tells the true story of the title character, an orange-seller (and probably a prostitute) who rose to fame as one of England’s first great leading actresses and then caught the eye of King Charles II, who fell in love with her and took her into his court as a mistress. Rather than trying to write a straight biography, though (even if that were possible with the sparse facts known about her), Swayle opted to turn her play into a witty, enjoyable comedy complete with singing and dancing and snappy, sometimes bawdy humor. But this is not just a rags-to-riches tale. 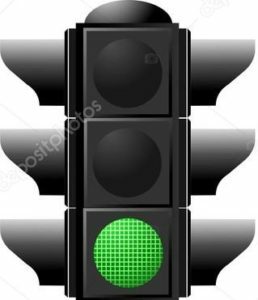 It touches on issues from the importance of family to the political machinations of power to the problems of celebrity. Nell is deeply in love with Charles, but not everyone in his court is happy about a former prostitute from Cheapside living in the palace, and Nell makes no effort to hide her past. (In one historical note we do know about her, when a group of angry Londoners tried to pull her from her carriage in the belief that she was the king’s other concubine, an unpopular woman known locally as “the Catholic whore,” she quipped, “Hold, good people. I’m the Protestant whore!” to loud acclaim.) She never hides the fact that her mother runs a brothel in Coal Pan Alley or that she once worked there, instead using her strong sense of humor to celebrate the things in life that bring her happiness…and to chop a few enemies down to size. As Nell, Scarlett Strallen is a pure joy. Whether exchanging banter with actors as an orange-seller, trying to learn what actors referred to as “the attitudes” (physical manifestations of anger, love, grief, fear, etc. ), engaging in disarmingly uncompromising repartee with the King of England, or taking the stage herself to destroy a rival with comic panache, Strallen’s playful demeanor and almost perpetual smile is a constant reminder that this is a woman for whom life has taken a shockingly positive turn, and she’s enjoying the ride. She also manages to make the play’s few darker moments play beautifully, her more sincere and powerful “attitudes” easily capturing the moments. The bottom line, though, is that if Strallen were not having a great time, neither would the audience. Fortunately, she (like her character) seems to be having the time of her life. The rest of the cast is every bit as good. Playing King Charles II, Timothy Edward Kane displays all of the wit and roguish behavior that so endeared the real King to his people. Larry Yando plays the conniving Lord Arlington, Charles’ closest advisor and a leading political opponent of his relationship with Nell, with an air of constant threat that lends a bit of conflict to the plot. Natalie West has a hilarious turn as Nell’s dresser, an older woman who is pressed to perform while Nell is at court. Emily Gardner Xu Hall plays the roles of two different mistresses of the king, and Hollis Resnik also plays a double role: as England’s Portuguese Queen Catherine, who is understandably (and comically) overwrought by her husband’s philandering, and as Nell’s mother, the unabashed brothel owner who feels her daughter has risen too far above her station (a situation for which her sister, played by Emma Ladji, becomes a constant reminder). Along with the rest of the plot, a significant part of this play pokes fun at theatre itself, at least as it existed in Restoration England. The poet and playwright John Dryden (Christopher Sheard) is portrayed as almost entirely effete. 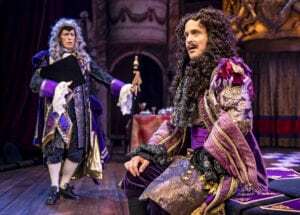 John Tufts, as the leading actor of Nell’s theatre troupe, the King’s Company, shows us a sincere lover who hilariously overacts his roles as lover on the stage. David Bedella plays Edward Kynaston, the actor in the troupe who, before the arrival of Nell and the new decree that women could take the stage, had played all of the women’s parts, and whose caustic relationship with her is a source of great comedy. (A scene in which he seeks to instruct her in the language of the fan is delightful.) As Thomas Killigrew, the leader of the King’s Company, Bret Tuomi is entirely a political animal, ready to sway whichever way the wind is blowing. And Richard David is wonderfully funny as the actor-in-training Ned Spiggett, who is the one who forgets his lines at the start, opening the door for Nell’s delightful barbs from the audience. Director Christopher Luscombe, using all of the aisles and even the balcony, keeps the action flowing and the picture changing even on a static set very much in keeping with Restoration drama. (Hugh Durrant is responsible for scenic design as well as costumes, which are impeccable.) A small ensemble playing period instruments is directed by Jermaine Hill, whose instructions to them clearly included, “Have fun.” Amber Mak’s choreography is outstanding (and, as with Luscombe’s direction, at times outrageous: Swayle says that ribald humor is necessary “in the name of historical accuracy”). Greg Hofmann’s lighting and Stephen Ptacek’s sound are perfectly on point as well. Nell Gwynn is not a perfect play. Ladji’s character, for example, is almost criminally underdrawn for so significant a role. But such quibbles aside, this is the kind of play that makes you want to stand up and cheer. It is so full of joyful, exuberant performances that even its antagonist, Arlington, gets laughs. It is, pure and simple, theatre at its best (which it often is when making fun of itself). It’s a comic triumph. Miss it only if you are allergic to laughter. 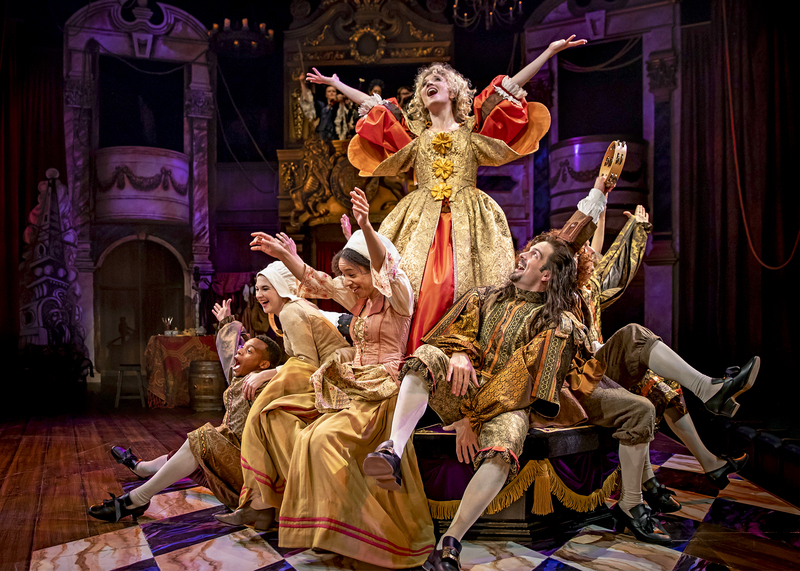 Nell Gwynn is now playing at the Chicago Shakespeare Theatre, Navy Pier, Chicago until Nov 4. Performance times vary; check the website at Chicago Shakespeare Theatre for tickets, schedule and times. 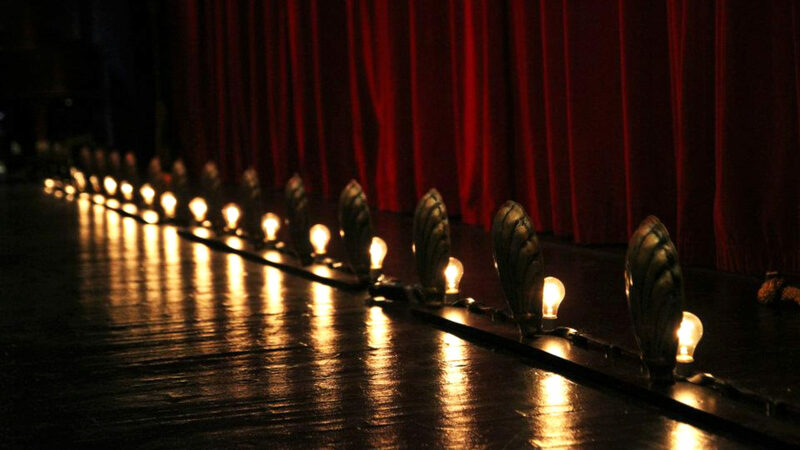 Find more information about current plays on our Current Shows page and at theatreinchicago.com.